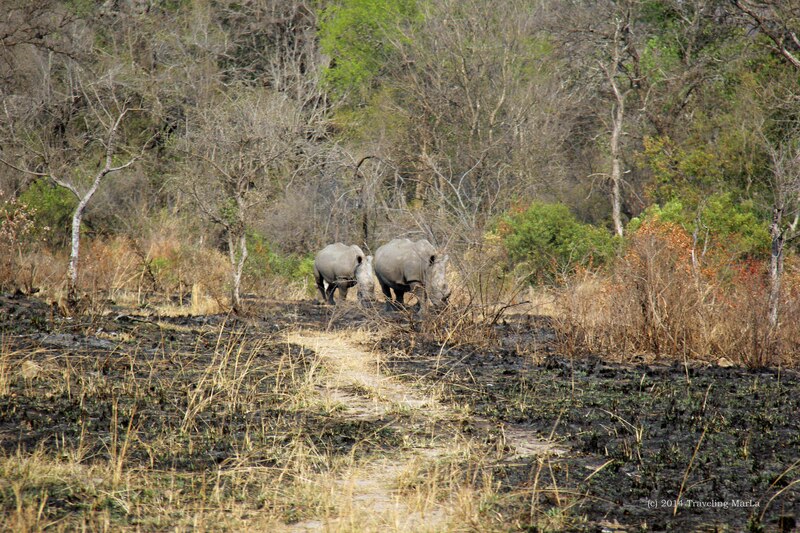 On our last vacation to Kruger National Park, we were fortunate to see several rhinos. While we’re far from experienced game viewers, we learned pretty quickly to watch the path of a grazing animal and look for areas around us (some game paths are not as obvious as others) where it looked like it might be heading to cross the road. Kurt was particularly adept at this, spotting a rhino or an elephant across a long field and telling me where to stop so we would be able to watch it cross the road while staying at a safe distance. 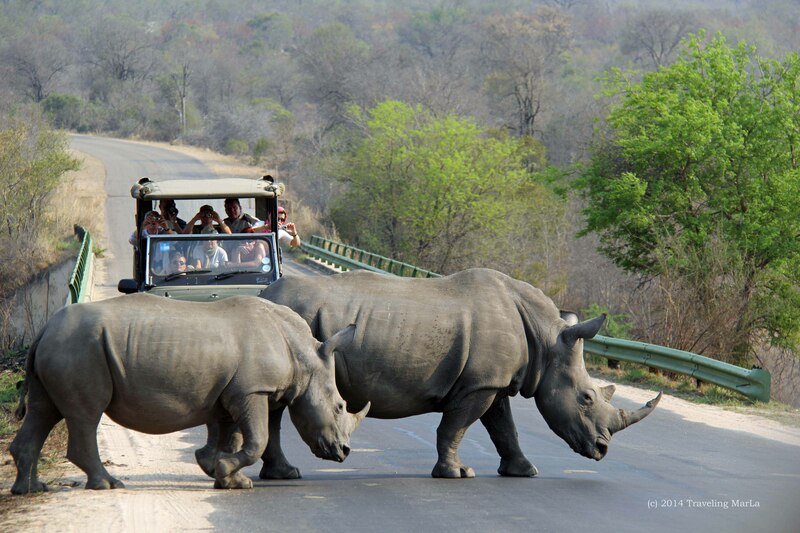 In one instance, I was driving along and it was I who first noticed two rhinos in the distance. We watched for a bit as they ambled along, and when it appeared they were moving in the direction of the road, I scanned in front and behind us for the game path, but didn’t see it. It meandered along the adjacent field, and then disappeared into the brush of the hillside. When we saw this pair headed toward us, we backed up, giving them plenty of space to cross the road. Then I realized it was directly underneath us. We had plenty of time as they were still far off, so I backed up several car lengths behind the area where the path crossed the road, to give a safe, non-threatening distance in front of us to watch them cross. But as anybody who has traveled to the parks here knows, tourists can get pushy and almost crazy when it comes to game viewing. Sure enough after I had backed up, another car came alongside me, saw what we were looking at, and instead of realizing or assuming that I had already parked a sensible distance, they pulled forward and parked directly in front of me, blocking my view. Mama rhino checking out the road before her (yearling perhaps?) joined her. 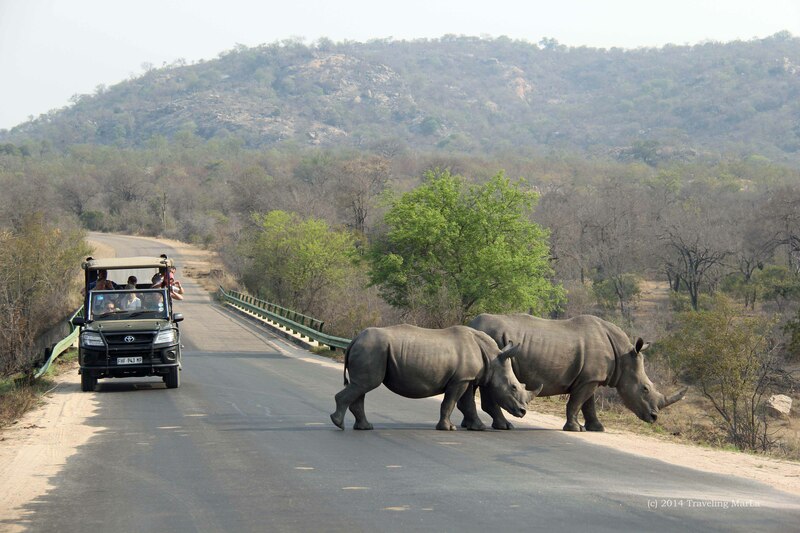 As the rhinos got closer, the rude (or perhaps just clueless) occupants of the other car finally realized they would be far too close to the path. I saw their reverse lights come on. They backed up until they were in front of me but realized they were still too close (uh, yeah, that’s why I was as far back as I was! ), and since they could not back up any farther, or even angle backwards out into the middle of the road (other vehicles were now parked in the middle of the road next to me) they had to move forward. After a brief pause behind a safari vehicle on the opposite side, they decided just to continue on. Greed had cost them an opportunity for a viewing spot. 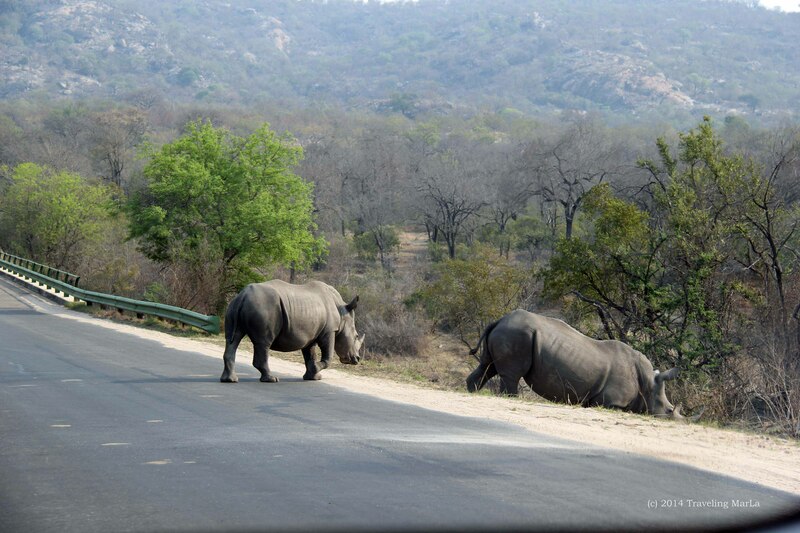 Mama and older baby rhino crossing the road in Kruger National Park. Thankfully, they at least acted intelligently when they realized they were too close, and got out of the way. There have been a number of incidents in The Kruger that have made the news, where tourists have acted foolishly, driving too close to elephants or rhino, and even lion. In one recent case, an elephant felt challenged by an unyielding car, and had to be put down. This is an age of mega-zoom cameras. Even iphones have the capability to take good photos from a safe viewing distance. Here is one of the iphone photos I took. It is in zoom and it is clear. There’s just no reason to get so close. 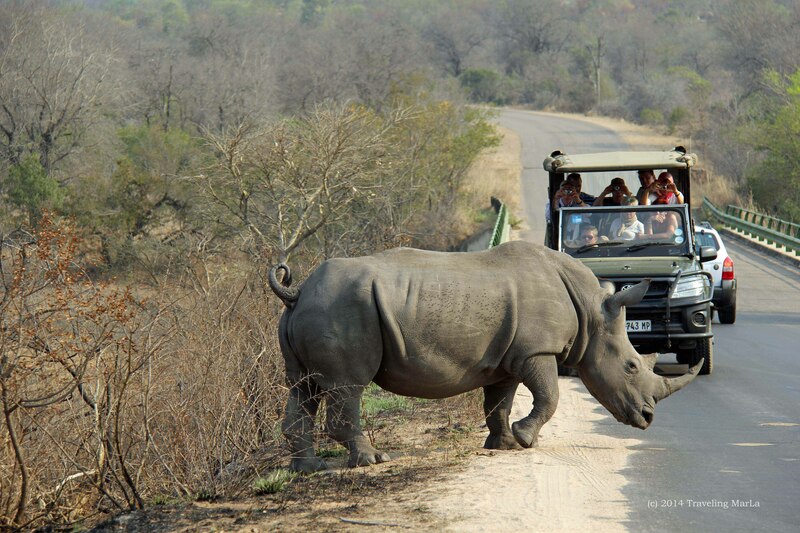 There have been a lot of interesting discussions about the problems with tourists in the park, and I have to say I agree with a lot of the complaints of News 24 readers and others—that places like Kruger should implement a pre-entry safety orientation. Gee, I can’t walk onto any major construction site without first watching a safety video and getting a lecture on the possibility of something dropping on my toes, and I can enter a major wildlife park with only some writing on a slip of paper? While we received literature that talked about safe viewing practices, nobody verbally told us what to do if we encountered a bull elephant (we encountered many) or how many car lengths to stay back from animals crossing the road. And until you’ve seen the videos of what happens in these encounters, you may not realize the gravity of the actions (or inactions) you take on your vacation. There are enough videos circulating on the internet to create a proper montage that could be mandatory viewing for every tourist entering the park. If teenagers learning to drive can sit through footage of road deaths from improper driving, I think tourists entering a wildlife zone can sit through footage of similar life-and-death blunders. And this footage should be available with multiple language subtitles. I remember seeing one comment after the latest elephant incident, suggesting that park officials place one of the flattened and crumpled cars at each entrance as well. I think that’s a brilliant idea. The first rule of park visitation should be respect and even a little healthy fear. Convenience to tourists should be a lower priority. Here’s the video of the elephant encounter with the British tourists. To repeat: this elephant had to be put down after this encounter. The one suggestion I saw from readers which I hope never gets implemented is the removal of self-driving in the parks. I would hate to see all the sensible visitors lose the opportunity to safely navigate Kruger wildlife because of the terrible blunders of the minority. P.S. Do you know the plural of rhinoceros? Elephant rage video was crazy!! Stupid puny humans!! Fabulous post! I have to say, Marla, & okay I know I haven’t met you – yet, but I just gotta say, I love you! I really do. You’re my kinda girl. Our poor hubbies. 😉 I, also hope they put a stop to the self driving nonsense in the park. There are good reasons for the professionals! Well done! I would love to re-post this – with your permission of course! Hi CM, Thanks for your kind words. You’re welcome to use it, but I want to note that self-driving is the one thing I do want to keep. Sorry if my wording was confusing on that. I wouldn’t want to have that privilege removed owing to the actions of some foolish tourists. The reason I want to keep self-driving is because I don’t enjoy the packed safari vehicles. I’ve found them to be noisy, crowded and having to crane my neck around two or three other people leaning to look at the same thing unless I happen to have window seat of the side of the vehicle seeing the animal. And the private game drives are too expensive for us. What I love about just Kurt and I driving are that we each have a spacious seat, we choose how long we want to look at any given area, and we simply hand the camera back and forth with nobody between us, to take photos. That said, we still go on game drives, because there are times we just want to not drive and not think about where to go or what to view, and of course because the high-seated viewing is wonderful. And I love that Kruger locks up the tourists by 6pm so that the only night viewing is in the safari vehicles, as well as the early morning drives. When Dylan and I were in Yellowstone this summer, we saw some amazing wildlife: moose, bison, elk. We also saw dozens of people crowding them, parking their cars right next to them, getting out to walk within a couple of yards of them. I was both worried for their safety (for obvious reasons) and furious that they were so blatantly encroaching on the space of these still-wild animals. I’m not sure if it’s lack of exposure, lack of education, or blind willingness to place the desire for a good story and photo above safety, but it makes me mad. And I think it’s absurd that the elephant in that encounter you highlighted was the one who paid the price for selfish tourists behaving foolishly. In my opinion, it comes down to respect and personal accountability, which many people seem to forget as soon as they cross into parks. I remember a similar experience there. In fact these drives remind me so much of the Yellowstone experience with the wildlife so close and the need to stay inside the car.